Guest posts are a solid way to drive traffic back to your site, by increasing the ranking of pages with backlinks, and by generating interest with audiences bigger than your own. It’s a vital part of any content marketing strategy, but it’s also a pain because — let’s be honest — it involves working with other people. 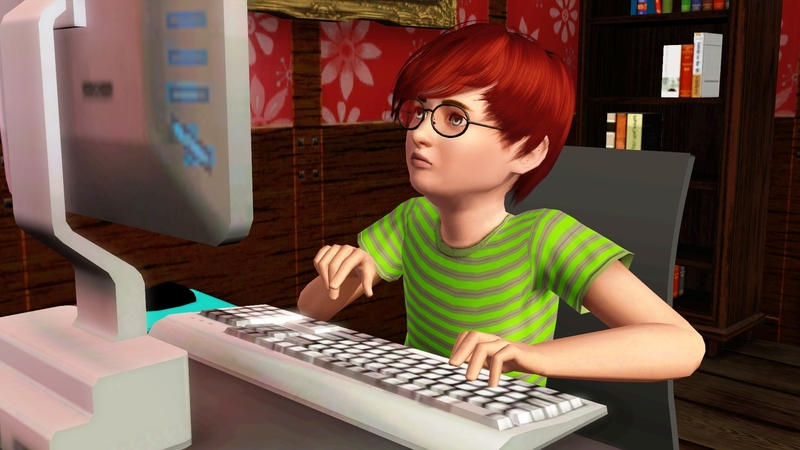 When you’re building your own blog, you can be certain that anything you write will be published. With guest posting, you need to pick a blog you’d like to write for, pitch, negotiate, and go through an approval flow. It’s a longer process with more weak points. And that’s why you can’t just run in, all guns blazing — you need to have a system. There are a few different ways to do this, but the way I like to do it (because it helps me target blogs on a more personal level) is to make lists of blogs I like to read. I usually find the blogs naturally, but you can use a tool like Ahrefs or Buzzsumo to find blogs a particular category, then export them to a spreadsheet. When you’ve got the blogs you’re wanting to target (this could be a list of just 20, or a list of 2,000, depending on the scope of the project and how much of the target blog content you’re willing to read), you need to find the contact emails for them. The way I do this is to put the list with the blog title and URL in Airtable (a database, but Google Sheets will do) and having a VA find the contact details with an email finding process. 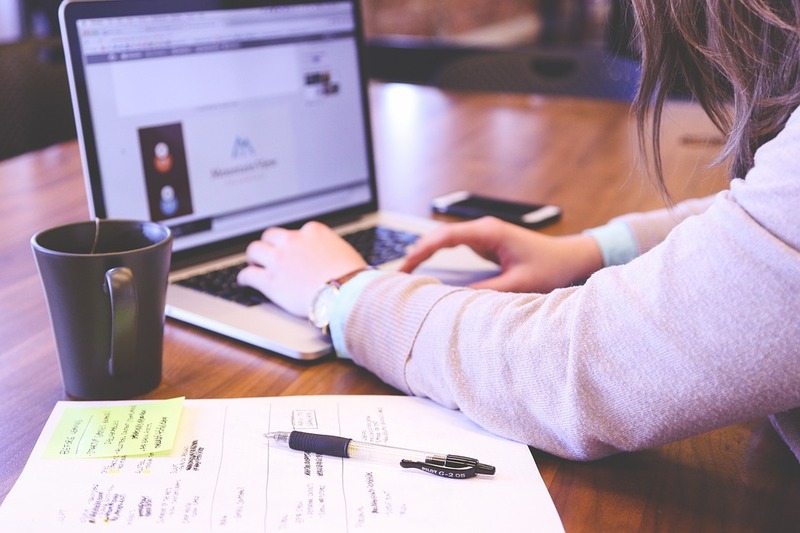 The most important thing is to never target the wrong blog with the wrong kind of pitch. It will make you look like you’re carelessly sending emails out at random, drastically reducing your chances of getting accepted and giving you a bad name. 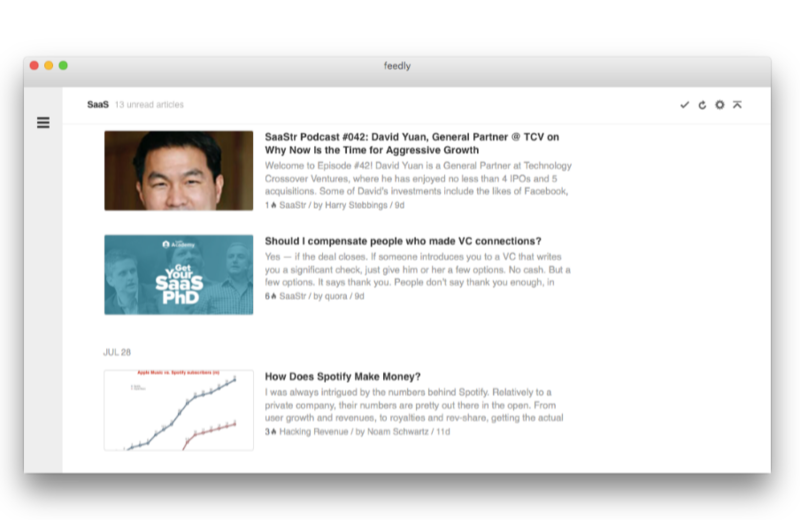 I’d suggest reading the blogs by adding their RSS feeds to feedly. In the same spreadsheet as the contact details, categorize the blogs. This could be ‘marketing’, ‘podcasting’, or ‘Google Adwords’. Just remember to be consistent, and focus the categories down to just a few. For every category, you need a list of titles. When you’ve got your list of categorized blogs, it’s time to think up a selection of titles you’re going to pitch them. The great thing about being careful with categorization is that you’ll get to refresh your mind on what the blog you’re emailing writes about, and get some great topic ideas for this section. If you’re doing a large scale project and you’re planning on emailing 200 blogs in the same category, think about how you’re going to handle the requests for the same title. The best way to do this is either to brainstorm more titles, or drip the emails out in batches of 30-50 so you can cross titles off the list as you go. Then you don’t have to write about the same thing over and over again, and you’re not in danger of sending two blogs the same title. 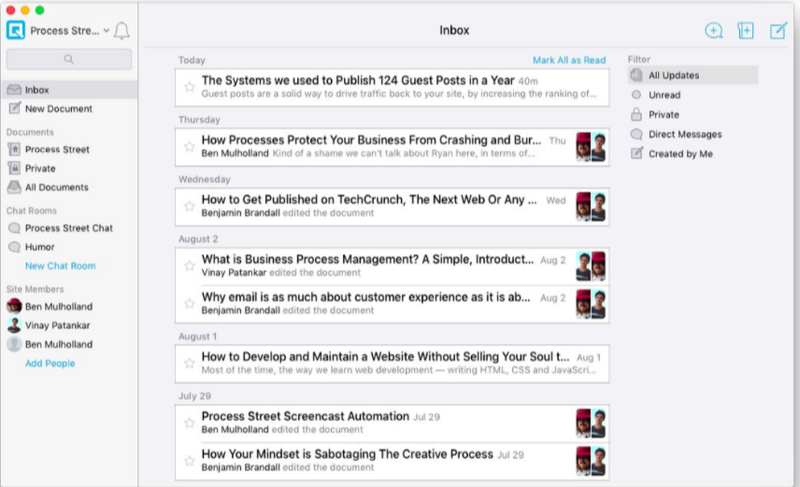 At Process Street, we use Close.io to manage our email outreach. For every block of titles in a category, I make an email template targeted at that category. If you’ve followed the process up to this point, you’ll be sending that only to the right blogs because you will have hand picked them. You don’t want to be the guy sending over an email that makes no sense! This part doesn’t take long at all. It’s the title writing and email template generating that’s the longest part here. There are a lot of different apps you could use to track your guest posts, but none more visual than Trello. We use a board with several lists and move the cards through the funnel according to their progress. We also share a board so we can easily notify each other to proofread. The only bit of upkeep here to make sure you and your team are processing your emails every day to add new acceptances into the board. And you should always follow up with publications you sent a piece to but didn’t hear back from. 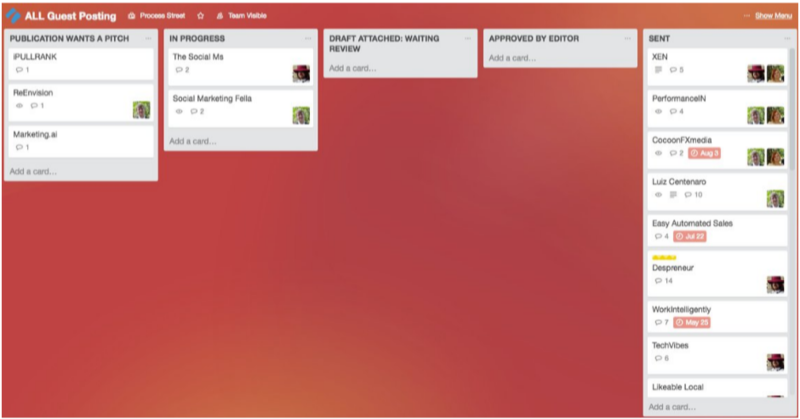 By using a Trello board, you can track that easily. 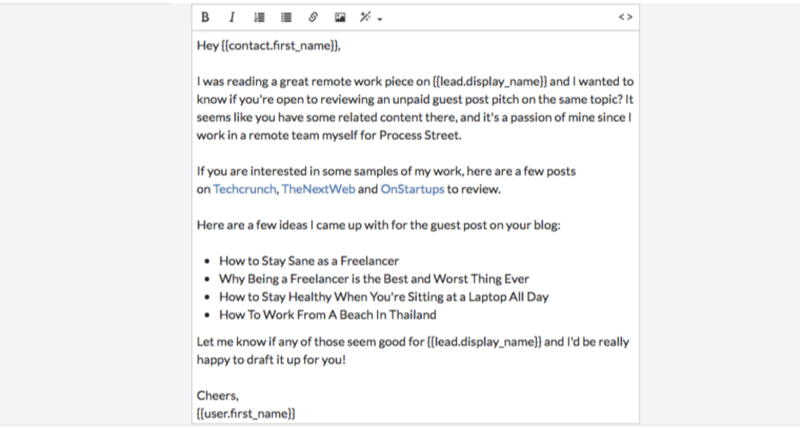 Quip is like a better version of Google Docs, built specifically for teams of professional writers to collaborate. When you add a document to Quip, it appears in your team’s inbox and you get notified when they read it. They add comments and make tracked edits, which helps you improve as a writer and is a great team-building exercise (as well as the best way to make sure you’re not accidentally sending blogs garbage articles). Now you need to get the article out of Quip and into Google Docs to send back for review. The workflow I have for this to export from Quip as HTML, drag into the browser then copy/paste the result into Google Docs. This means I don’t have to do any extra Google Docs formatting, or fix images or links. It all just works straight from pasting. Reply to the publication telling them the piece is ready. Make sure you’ve got the sharing settings on ‘Anyone with the link can edit’ or you’ll slow the process down. Move the Trello card to ‘sent’, and take a rest before starting work on the next post. Every blog is going to have its high value pages. These are highly relevant pages to your business that would bring great returns if you were to rank well for them in search engines. When you start a guest posting campaign, you either want to have one high-value page in mind, or a list of several you can link back to depending on the category of the blog. It’s a lot of hard work, but, as you can see, the rewards are definitely worth it. Benjamin Brandall is the head of content marketing at Process Street, where he writes on productivity, SaaS and marketing. He also runs his own blog about UX and writing. Great article! This really helps bring to light how to effectively do guest posts without being invasive or intrusive to the blogger. 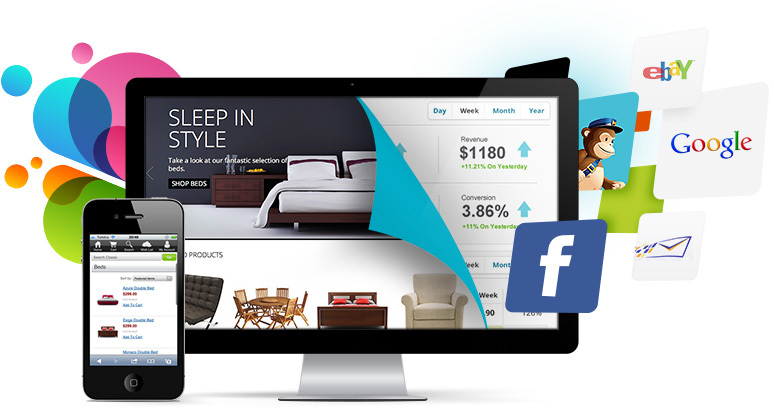 You want to come across as genuine and bring value to their project without seeming needy. I like how you created specific templates and organized each blog into an Excel file. This is genius as it removes duplicates and creates a strong relationship with the blogger. Organization is key when it comes to guest writing as duplicates will saturate your brand image. Lastly, I really liked how you mentioned tools better than Google Docs like Quip and Trello. Managing your feedback whether it be positive, neutral, or negative is key in determining who is your strongest ally. I definitely plan on using these strategies and learning more about other bloggers before I ask them to be a guest writer. Knowing their content is key and I recommend everyone to learn about their favorite blogger’s value pages.